The Syrah based, entry-level cuvee is also flat out gorgeous. 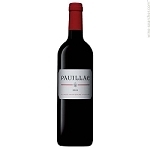 The 2014 Parabellum Rhone's deep ruby color is followed by classic aromas of peppery herbs, dark berry fruits and hints of minerality, full-bodied richness, gorgeous purity and a fresh, focused, lively texture that keeps you coming back to the glass. Like with the Parabellum Bordeaux cuvee, there's slightly less density than the Estate Syrah, yet it's impeccably made and will evolve gracefully.